Despite the fact that AdWords is still the most used and recognized outlet for PPC advertising, Bing Ads has increasingly gained the attention of many. However, most people are still unclear about the benefits of using Bing Ads. In fact, I would dare to say that there are not even completely clear about what Bing Ads is all about. For this reason, we have decided to shed some light on the unique benefits that Bing Ads has to offer by interviewing John Gagnon, Bing Ads Evangelist. He shares with us six facts about Bing Ads that will peak your interest. In his interview, he covers insights on the platform, upcoming additions, and predictions for Bing Ads as well as some optimization tips. Who even uses Bing? is a question not uncommon to hear. Actually, there is a misconception about Bing and its usage. Bing’s strategy has been to put the search where people are, instead of expecting someone to come to the search box. They have achieved this by initiatives like instating Yahoo as the default search engine for Firefox and the device integration of Bing in devices like the Windows Phone, Xbox, Kindle Fire etc. In addition, they have partnered with websites like WebMd, or the Wall Street Journal that deliver the Bing infrastructure in their sites. 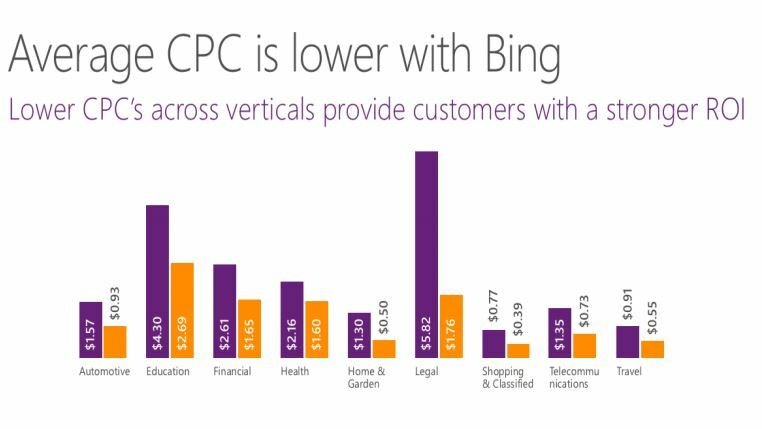 Now that we have seen that Bing accounts for 32% of the search market share, it is important to note that the people within this group also have specific characteristics that you should be aware of. Depending on your industry or business type, tapping into the Bing audience could result in a more successful PPC advertising experience. It is true that Google AdWords has the largest audience, however it’s is not just about the quantity of people you can reach, rather about taking advantage of the unique characteristics of the Bing audience. 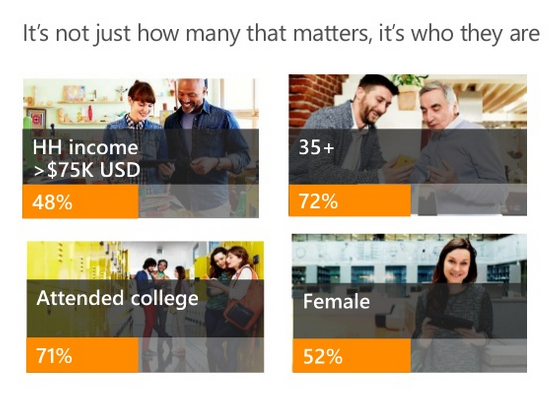 The Bing Ads audience is “A little older, more income, more educated and slightly more female” Gagnon says. Therefore, if for instance, you sell collector edition cars and your business is geared towards an older, more affluent consumer you might want to look into advertising on Bing as an addition of AdWords, and so on. 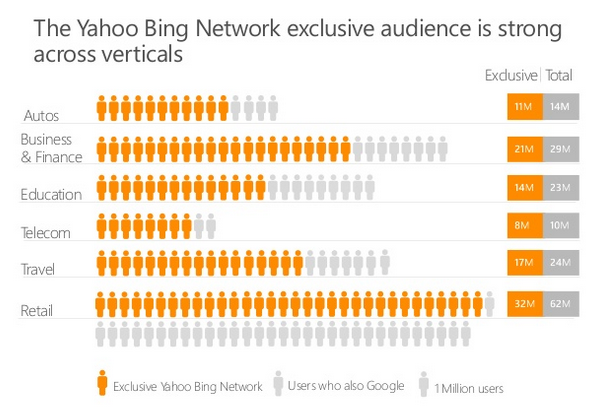 Once you dive deep into verticals, it’s interesting to see the impact that Bing has on them. If for instance, you were advertising on Google and were part of the auto industry you could be seriously missing out on a lot of clients taking into consideration that Bing has around 13M unique searchers in that specific industry. Again, if you recognize that your business is part of any of the industries depicted in the graph, then, by all means, take advantage of it. These are people that search for your industry and are not using any other search engine to look for what they need. In addition to the unique audience you can capture, it is also possible to pay less for this investment. According to data provided by Bing, there have also seen a decrease in cost per click, in comparison to Google AdWords but particularly in specific industries. 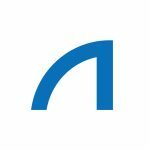 When using Bing, it becomes apparent that they put an effort into providing relevant reporting and data tools that can truly help you make an impact in your campaign. A great example that illustrates this is that they show all search terms in their reports (regardless of if they get clicks or not). “We try to give you more control and transparency into your data. So we have reports like Share of Voice and Historic Quality Score on the data side along with Tablet Modifiers and the ability to separate Search Partner Network for targeting.” John says. The Share of Voice Report is very interesting, and nothing like it is present in the AdWords interface. In a nutshell, this report allows you to see the impressions Bing Ads estimates you are potentially missing out on and presents you with the exact reason why this is happening. The report is run at a keyword level and can help you direct your optimization to the areas that need the most improvement. Bing provides a historic overlook of your quality score by allowing you to see how it fluctuates every day. By accessing this data, you can pinpoint how optimization or changes you have made to your account have impacted your quality score. This information allows you to create different tests and is another level through which you can measure the impact of your optimizations. You can view this data in the keyword performance report available in the Bing Ads interface. Bing Ads allows you to modify the bids of ads appearing on tablets, and in that way providing the advertiser more control over device targeting. In addition, it allows advertisers to break down the Syndicated Network separately. According to Gagnon, Bing Ads has been working hard to gather feedback from advertisers to launch improvements and new features. Some of these include improvement to conversion tracking with the launch of Universal Event Tracking, which will allow you to use only one tag for your website regardless of the number of campaigns or accounts you may have. In addition, Bing is working on simplified device targeting that goes in-line with Enhanced campaigns. So you will be able to set bids for desktops, tablets and mobile devices as you deem more convenient. Auction Insights and Enhanced Sitelinks will be available globally, and many UI Improvements for speed building will come in the Fall. John says that transitioning from AdWords to Bing is actually not that big of a shock considering Bing Ads is aware that most users are accustomed to the AdWords interface, therefore, try to make it a bit similar. Don’t underestimate the impact that a Bing Ads campaign could have for your business. Be proactive and find in Bing another way to expand your PPC advertising efforts while increasing your ROI.